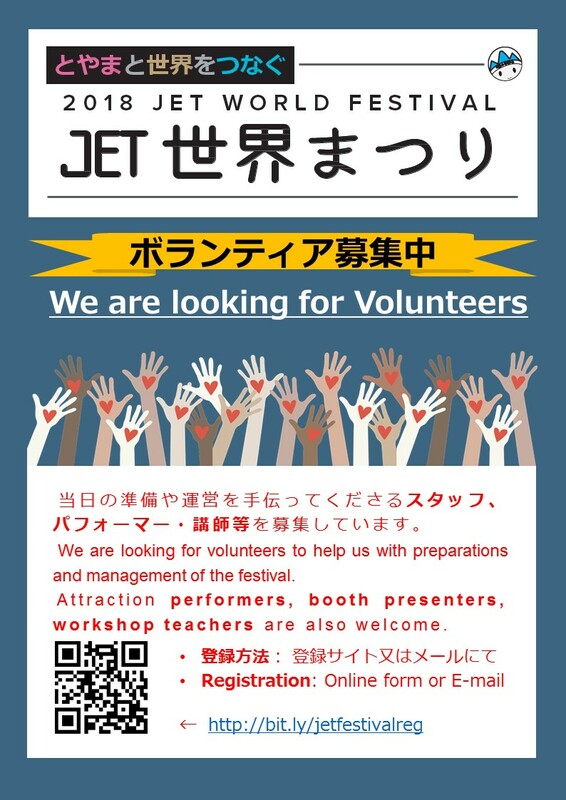 The volunteers provide the much needed support to hold the event, making it a space for cultural exchange where visitors can enjoy a variety of experiences. An open expo of countries and cultures from around the world! In addition to around 20 country booths in total such as Brazil, USA, China, South Korea, Russia and India, we will also feature other booths, such as AJET Charity and cultural exchange associations! This is an awesome stage show with a variety of musical and dance acts. We are accepting performance applications and backstage crew! Serving tea and cookies from around the world, the International Cafe is one of JET Festival’s most popular booths! The perfect booth for those with a sweet tooth! Kids, games, coloring, face painting, crafts, fun, fun fun!!!!!!! Did I mention fun?! This corner lets participants learn about other cultures through workshops and hands-on experiences! Have fun teaching visitors cultural activities! !